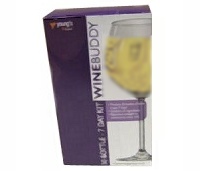 Sauvignon Blanc refill kit for the WineBuddy, the smallest reusable white wine kit available. You will require the starter kit, which contains all equipment and ingredients to make 6 bottles of great tasting Sauvignon Blanc wine (white) in just 7 days. Just add sugar and water to the refill kit. Equivalent strength to commercial wines 11%.